Blue Note is admired for immaculately organised sessions. In this respect, Riverside should also be granted a place under the sun. When founder Orrin Keepnews signed Thelonious Monk in 1958, he decided to dedicate the pianist’s label debut album to the work of Duke Ellington, revealing challenging conceptual thinking. Riverside also created new vistas for its roster. 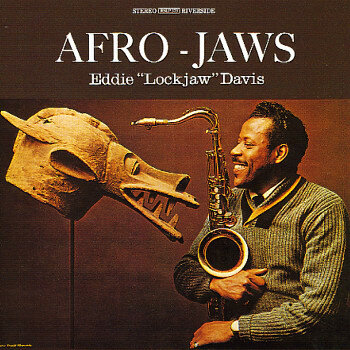 Eddie ‘Lockjaw’ Davis’ Afro-Jaws is a case in point. It’s a well-rehearsed session involving carefully chosen personel and repertoire. Tough Tenor Eddie ‘Lockjaw’ Davis adapts well to the Afro-Cuban setting reminiscent of Dizzy Gillespie’s groups. Should we expect otherwise? Davis blew horn on stage at Minton’s Playhouse amidst the bop innovators in the late forties and early fifties, functioning as de facto jam session MC. He is known for his work in the classic organ combo format of, notably, Shirley Scott and extended cooperations with the equally hard blowing, fellow tenorist Johnny Griffin, but also had journeyed through the big bands of Cootie Williams and Count Basie. Experience abound. Gil Lopez wrote four out of seven infectious tunes and his arrangements are in your face, perfect foil for the gutsy sound of Davis. A major part of the tight group sound is the rhythm tandem of drummer Ben Riley and bassist Larry Gales, who would go on to form a good team the following years for Griffin, Davis and, in the mid-to-late sixties, Thelonious Monk. Wild Rice sets the album’s pace, opening with a mix of heavy percussion, tenor and brass before leading to the buoyant theme and four/four solo section. The rest of the album follows the same course more or less. Davis has a suave way of weaving through the themes and his solo outings are on the money, both displayed with a relentless beat. Alma Alegre is the odd one out, a slow, grinding piece that has Davis beautifully riding the waves of an intricate, multiple bar theme. Ever since Dizzy Gillespie introduced Chano Pozo and Gil Fuller’s Tin Tin Deo into the jazz realm, musicians have been fond of playing it. ‘Jaws’ kickstarts himself into furtive action after a couple of curious, worn clichés and Clark Terry is his usual masterful self. The tempo of ballad Star Eyes, the sole standard off the album, is taken up a few notches and graced with a honky ‘Jaws’-solo. Davis’ Ben Webster-like mindset works equally well in the jivy bop riff Jazz-A-Samba. The album ends with the title track Afro-Jaws, a relentless groove. Special mention for the slightly surrealistic record cover. Very carefully ‘organized’ as well. ← Take Three with Bruut!